On 27th May we finalised release 1.0 of Reviewer’s Workbench. RW represents the culmination of several strands of research and development that I had been involved with over the last couple of years. In 2011 I set up Digital Linguistics to sell Review Sentinel. Review Sentinel is the world’s first Text Analytics based Language Quality Assurance technology. I first publicly presented Review Sentinel at the TAUS User Conference held in Seattle in October, 2012. In January 2012 I became a member of the Multilingual Web Language Technologies Working Group. Funded by the EU, this Working Group of the W3C is responsible for defining and publishing the ITS 2.0 Standard. ITS 2.0 is now in Final Call stage of the W3C process. 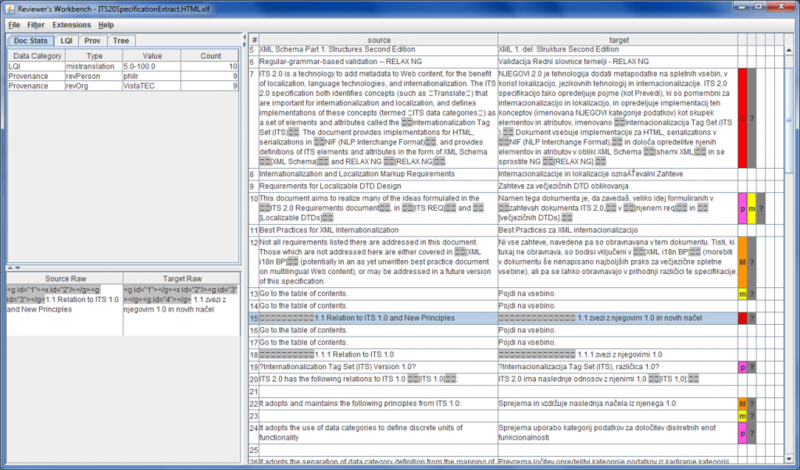 I can safely assert that Reviewer’s Workbench is the world’s first editor to utilise text analytics and other metadata that can be encoded with ITS 2.0 – such as machine translation confidence scores, term disambiguation information and translation process related provenance – to bring new levels of performance to the tasks of linguistic review and post-editing. What’s more is that Reviewers Workbench is completely inter-operable with industry standards like XLIFF and toolsets such as the Okapi Framework. Reviewer’s Workbench allows you to personalise the visualisation of all this available important, contextual and useful data to inform and direct post-editing and linguistic review effort. This is just the beginning. Feature set planning for release 2.0 is already very advanced and includes more state-of-the-art facilities. Stay tuned! This entry was posted in Uncategorized and tagged Digital Linguistics, ITS 2.0, MLW-LT, Okapi, Review Sentinel, Reviewers Workbench on June 1, 2013 by admin.